We can proudly inform you that the neutering project was a success. In one week 47 animals were sterilized: 1 goat (male), 5 rabbits (4 females, 1 male), 7 cats (5 males, 2 females), 12 female dogs and 22 male dogs. This is a serious progress as since the beginning of the year over 80 animals entered. However, the shelter accepts new animals every week and this is why we need to continue insist on neutering. The aim would be now to neuter 5-10 animals per week. Our objective is to always give neutered animals for adoption and at some point to have all animals in the shelter neutered. It is our drop into the enormous need of controlling the overpopulation of unwanted pets in Portugal. We would like to give enormous thanks to our vets: Esther and Diogo and everyone once who helped during that week. We would like also to thank everyone who contributed to the neutering project. It was a serious financial effort but we managed! Our main costs were sutures, anesthetics, painkillers and antibiotics. If you have not contributed but you would like to, you still can! As we want to have 5-10 animals neutered every week, you can contribute anytime: just send us an email. Our costs are materials such as sutures, anesthetics and antibiotics. Help us with the sterilisation project! 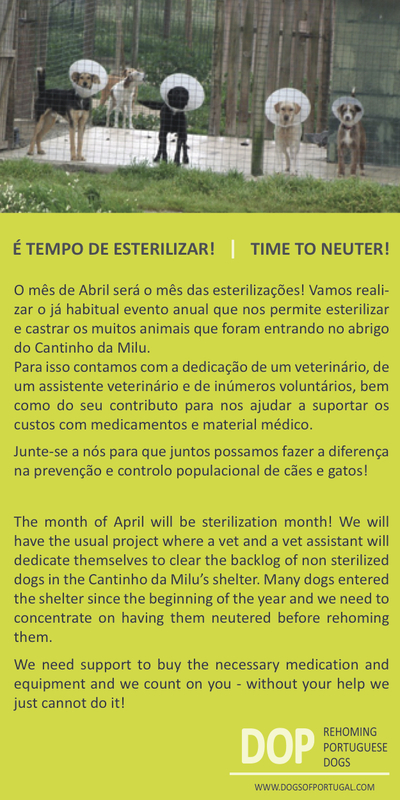 Dear friends and supporters: the month of April we want to concentrate on sterilisations. We need to deal with a backlog of new animals that entered the shelter since the beginning of the year. And we need your help. Just imagine that a bottle of Convenia, injectable antibiotic that we give to cats after the sterilisation costs 117€. Sutures for sterilisation – each box is around 25€. Anesthesia that our vet uses, a bottle of 10ml is 58€. We need you help! 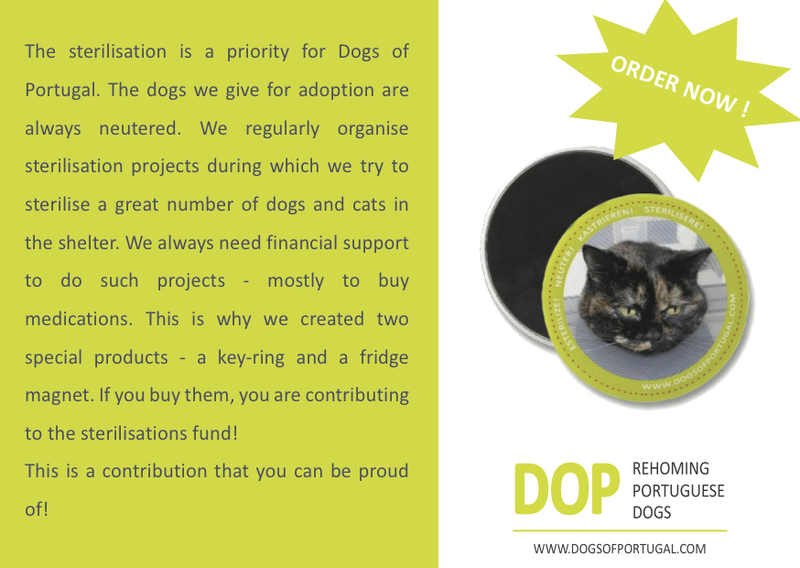 Any donation is useful but you can also buy our fridge magnets and key-rings – they will directly contribute to the sterilisation fund.